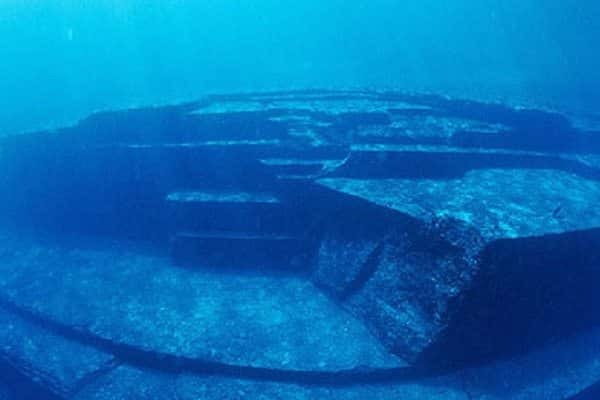 An ancient submerged rocky complex is standing right off the coast of Yonaguni, Japan. Among the structures, divers have found a mesmerizing pyramid and a few structures depicting the ancient rulers of this place. When asked about pyramids, where will your first thoughts run to? Egypt? Peru? Perhaps few would think of the pyramids in Nubia or those of ancient Mesopotamia (Iraq) and Persia (Iran)? Well, technically, the last three are ziggurats, but most of you know that already. 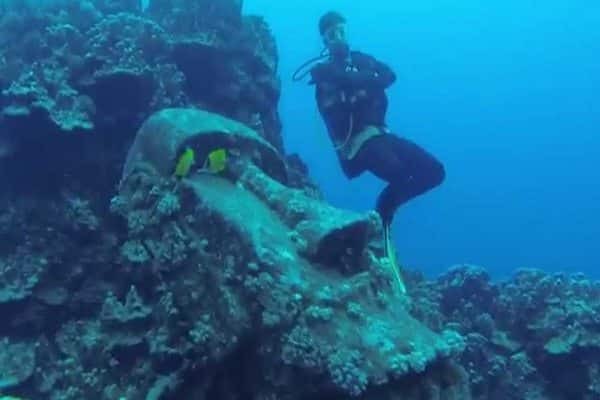 What you might not know, is that this mainstream list has been extended in 1987, when Kihachiro Aratake, director of the Yonaguni-Chio Tourism Association, observed while scuba diving a seabed formation that resembled very much an architectonic structure. What he discovered was later confirmed by a group of scientists directed by Masaaki Kimura of the University of Ryukyus as man made stepped monoliths that ultimately shaped a submerged pyramid from forgotten times. 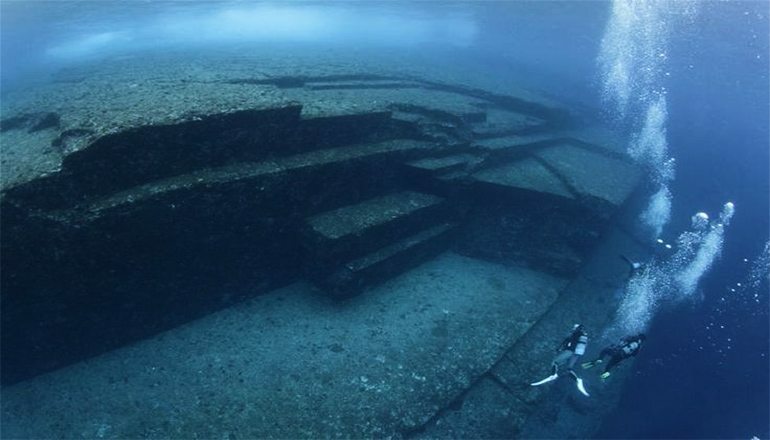 The underwater pyramid of Yonaguni is part of the Yonaguni Monument, a vast architectonic network of buildings, castles, monuments and even a stadium, all connected by an elaborate system which appears to be a network of roads. The submerged vestiges are most likely the aftermath of the greatest tsunami to hit Yonaguni, mentioned in the archives of 1771, having a wave height of over 40 meters that would definitely damage even our modern architectural landscape. According to Kimura, there are 10 structures submerged in the range of Yonaguni and 5 other under the territory of Okinawa’s main island. The massive ruins are spread on more than 45,000 square meteres and are estimated by Kimura to be at least 5,000 years old, taking into account the dated age of the stalactites found in underwater caves that collapsed along with the city. “The largest structure looks like a complex stepped monolithic pyramid, which rises from a depth of 25 meters” stated Kimura for the National Geographic News in an interview took in 2007. Robert M. Schoch, renowned geologist at Boston University for re-dating the Egyptian Sphinx, has a different opinion about the Yonaguni structures. He dated a sample of rocks and discovered that hey have been deposited some 20,000,000 years ago. Kimura admits that the basic rock structure is naturally formed, but it was later remodeled by man, as this seems the only logical explanation regarding the two stairs bridging the main terrace to the upper terrace, dismissing natural erosion. Kimura also pointed out there were no disjoined stones or blocks of stone at the base of most structures, also dismissing natural erosion. Both ancient and modern civilizations have used natural rock formations for a variety of purposes. The best example is the Great Sphinx of Giza in Egypt, etched in “living stone”, and the temples of Petra, Jordan and Mahabalipuram in southern India as well. More structures have been brought to light as divers kept exploring. One in particular shares a few similarities with the Sphinx in Egypt, portraying an ancient Chinese king or from Okinawa. This one sculpture was discovered 50 meters below the water surface and is now called “the stone goddess”, wearing a coronet and carved with long arms. The sunken architectonic complex contained a human head-like giant round rock, executed in the same fashion with the Moai stones in Easter Island, Chile. The head sculpture rests on the ground, almost contemplating the distant horizons. Some believe it might be a mythical giant like Atlas, who brought glory to this lost city. 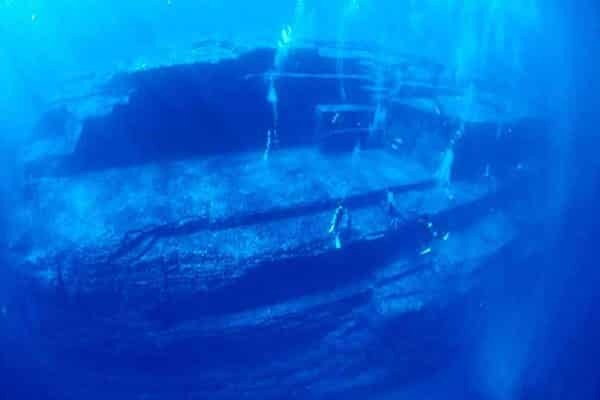 The aquatic pyramid and other relics found in Yonaguni could hold significant evidences of a sophisticated civilization that existed during the last ice age. Most archaeologists take into consideration a human extinction which occurred about 5,000 years ago, while some experts believe more advanced societies may have existed even 10,000 years ago but disappeared completely as the dire result of natural catastrophes. Previous ArticleNASA Scientist Admits Portals Are Opening Around Earth - Proof that Project Pegasus is Real?